Handset and tablet maker Samsung Electronics Co Ltd's app store has reached the milestone of 100 million downloads of its apps. 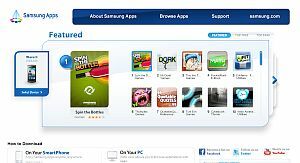 The app store is a portal where Samsung users can browse and download games, social networking apps, e-books and health-related services. Countries that downloaded the most apps were France, Spain and Germany. Samsung's app store covers 109 countries and has 13,000 applications for its smartphones that run on its proprietary Bada operating system (OS), according to Techtree. While initially the app store was aimed at its smartphones such as the Omnia, i8910 (Omnia HD), Omnia II and Omnia Lite, it now caters to a wide range of handsets. The app store competes with far more popular app stores such as Google's Android store, Microsoft's Windows Marketplace and Apple's App Store as well as older sites like GetJar.com.